Where all Comics Comedy Characters gone? More Comics Series Good or Bad? Last year 2015 had left many good and certain bad memories. Year 2015 was very special for some people and for many it has passed like an ordinary year. Let's talk about Raj Comics, year 2015 was an average year for Raj Comics and its readers. It was not very special or very bad, it was a mixed year. Last year, 21 new comics were released in 6 monthly sets. While, in the previous two years 2013-2014, 18 + 18 = 36 new comics were released. There was a slight increase in the number of comics released in 2015. How was the year 2015 for a comics fan? Let's have a look as a Comics reader. At the starting of the year in Jan 2015, Sarvsanhar and Hunters the last set of 2014 were in the hands of the readers. "Hunter", the year 2015 was started with such an outstanding comic. With the first set of 2015, Holi festival became even more colorful. "Narak Nashak Origin Series" came to an end with the comic "Narak Aahuti", which was released in the same set. In March, there was good news for Doga fans. Raj Comics team said, "Doga's solo comics soon will be published regularly in every set. In comparison to previous years, in 2015 you'll get even more comics." Raj Comics fulfilled their both promises, since the release of "Doga Nirmulk" (set no 3) every set is being released with a solo comic of Doga. In April, on the occasion of "Super Commando Dhruva’s' birthday, Raj Comics had been provided a special free gift offer on their online store. But, set No. 2 was not released on this occasion, which was expected by all the readers. Set No. 2 was released in late April, readers had got to read 3 new comics in this set. Doga Movie, it is always been a matter of discussion among the comics fans. In the middle of May, readers seemed some hope of its making. Raj Comics told their fans that, "The business success of movie Bombay Velvet is connected to the future of Doga’s film". Unfortunately Bombay Velvet had failed to achieve success, and since then there is no news of Doga movie on the behalf of Raj Comics. In mid-June, set no 3 the Sarvmanthan set were also released. It took 47 days to release after the previous set. Means, this set was released quite early in compared to the previous sets. This set was also released with 3 comics. In early August, the 4th i.e Kshatipurti set was released. From this set, every set began to be released with 4 new comics. In the middle of September, pre-orders for set 5 the Sarvsandhi set had been started. This time Pre orders were started a few days earlier than the expectations of the readers. Set 5 pre-orders had started exactly after 42 days of the Set 4 pre-orders. 42-days interval between the releases of these two sets. I think it was a great achievement for the Raj Comics team and good news for the readers. Once again fans were got to hear the news of Raj comics Movie. On 13 Oct 2015, Raj Comics team said, "The story of the film on Raj Comics Heroes has begun to discuss with Karan Kapadia in Mumbai." What is the progress of that conversation? And when the movie will start work on? Raj Comics have not told anything about it yet. On 15th Nov, Nagraj Janmotsav was celebrated with a great fervor at Raj Comics complex, Delhi. Several fans of Nagraj became the part of this celebration. On the same day, along with Nagraj Janmotsav the "Fifth Annual KalpanaLok Awards" were also organized. On this occasion, artists were awarded for their excellent imagination and for their contribution to the world of comics. In early Dec, set 6 the No Man's Land set was released. Opposite to the expectation of the readers, this set was released quite late. Probably, due to "Diwali Holidays", "Nagraj Janmotsav Celebrations" and the "Up-gradation of Raj Comics Official Website". On the Christmas sale of 2015, the discount rate had been increased by 10%. In 2014, there was 20% discount on the Christmas sale and in 2015 buyers were get 30% discount rate. On Dec 30th, "Free Comics Day" was organized. According to Raj Comics, on this "Free Comics Day", the orders numbers had been increased by 10% as compared to previous years. In 2015, total 21 new comics were released in 6 monthly sets. There's no doubt that the number of the released comics in 2015 has increased. But the number of sets were failed to cross the figure 6. According to their words, Raj Comics started releasing Doga solo comics in every set regularly. But these solo comics are of just 24-25 pages. All the fun gets spoiled in such a short pages comic. Readers are not happy with such comics. The comics of Aakhiri Series are also being released in 24-25 pages. How a reader might prefer a Multistar comic in just 24-25 pages. After the release of set No. 2, the comedy characters could not find place in the monthly sets. Bankelal, Fighter Toads, Gamraj the monthly sets seems incomplete without all of these. Something is Missing are they Comedy Characters? Current ongoing Comics series has been too much of. Except the two comics of the set No. 1 and 2 of 2015, the rest of the 19 comics are the parts of the current ongoing series. Means, just 2 complete comics were released in 2015, the rest 19 are unfinished parts of various ongoing comics series. Readers are entangled in these series. Whenever a new comic of a series is released, then the readers will have to reread the previous parts again. Raj Comics team needs to pay much attention on here. Too Much Comics Series Good or Bad? The first and the most important demand of the readers is, "A new set every month". In 2016, the monthly sets should be released as much as possible, so the readers will get to read more comics. Comics Series should not be pulled up so longer. If possible, not more than 2 to 3 series should be released parallel and new series should be started after the completion of any one of the ongoing series. Solo comics should be released with at least 32 pages, and should release constantly in every monthly set. At least one comic of a comedy character should be released in each set, doesn't matter whether it is of 32 pages. I think a comedy comic could be easily completed in just 30 pages, instead of an action-packed serious comic. 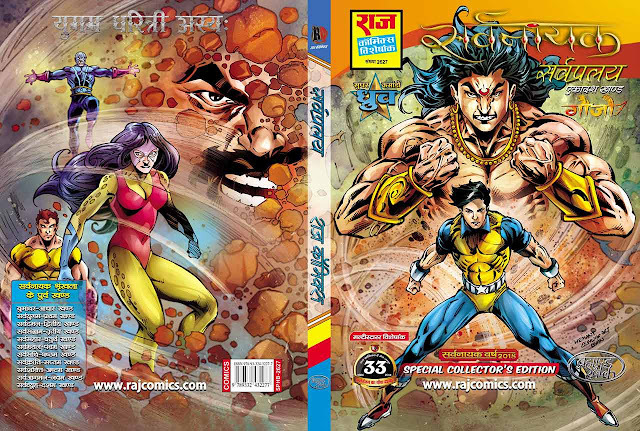 This year readers want to watch an animated movie on Raj Comics. Animated movie would be a bigger advantage, it will find the audience reaction and a live action film can be planned on. Another advantage would be that, "What is lacking and where? How will it be fulfilled?" the point will be revealed. Go ahead Raj Comics, you have hundreds of thousands of fans. Tell the whole world, "Why Raj comic is our Passion". We were with you, we are with you and we will always with you Raj Comics. I wish that in 2016, Raj comics achieve even more heights. I pray that the year 2016 would be prosperous and lucky for the entire Raj Comics team and their Millions of fans. Happy New Year to all of you. कुछ कमी है, क्या यह हास्य किरदारों की कमी है? अधिक कॉमिक्स श्रृंखलाएं अच्छा या बुरा? To reach the entire world Our Desi Heroes need your support. Share This ---- As Much As You Can.